Are you feeling less than enthusiastic about your life at the moment? Less than thrilled about your relationship with your horse? This may not mean that you’re actively having issues in your life or relationship with your horses, but I’m sure you know the feeling of KNOWING that there is more possible. As a life coach who was more or less raised around horses and with around 15 years of experience in the natural horsemanship and competitive hunter/jumper world, clients come to me when they are for whatever reason unhappy in their life. Riders come to me when they are unhappy with their relationship with their horse. My answer to each client is always the same: Authenticity. Authenticity is the key to living a happy, fulfilling life as well as enjoying a happy, fulfilling relationship with horses. In fact, the majority of the friction in life and in the relationship between riders and horses is caused by a lack of Authenticity. I believe that Authenticity is the best word to describe all your horse is seeking in you and all you are seeking in yourself. Merriam-Webster’s fifth definition suits our needs perfectly: “true to one’s own personality, spirit, or character.” Authenticity is when what we feel, what we think and how we act are in harmony. This can be more complicated to attain than it sounds… Many of us are not entirely sure what our “own personality, spirit, or character” is because we live expending much of our energy conforming to what the vision of “happy” is in our society at the time. In this quest for “happiness” we turn off our own guidance system: our body, our thoughts and the relationship between them. The real kicker of the situation is that, usually, that vision of “happy” that our society paints that we are chasing with all we’ve got isn’t what will make us happy at all, quite an oxymoron isn’t it? Why is Authenticity important in life? Without knowing who we are, what we feel, what we think and allowing that to influence how we act, we have no way of guiding ourselves to our own happiness. That is when we pursue the “happiness” advertised to us on a daily (often hourly) basis instead. A lack of Authenticity contributes to depression, anxiety, indecision, stress, mental breakdowns, emotional breakdowns, “mid-life crises,” and most other unpleasant mental and emotional spaces that many of us inhabit on a daily basis (I used to live in a continuous cycle of depression and anxiety). Why is Authenticity important to your horse? Horses seek Authentic individuals, whether this is in a herd setting with other horses or in a training setting with a human. In a herd, the most Authentic individual is the most trusted leader, because what they feel, what they think and how they act are always in harmony. 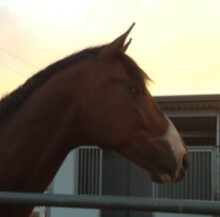 This horse is the one that can keep the herd safe in times of danger because they trust their instincts. This carries over to equine-human relationships. If how you feel, think and act are out of sync, you are an unsafe leader. Horses trust how their body feels above all else due to their incredible sensitivity. If you are unaware of how your own body feels, you are the most unsafe of leaders. Emotion is a controversial issue in the riding and training of horses. Most riders and trainers teach that emotions do not belong in the saddle or that very few do. I think this is due to the negative connotation of the words “emotion” and “emotional” in life in general. Ponder those words for a couple moments. What are the first words or images that come to mind? Be honest. Generally in everyday life and in the realms of riding and training we use the word “emotional” to describe what we feel is “overly emotional” or acting inappropriately on “negative emotions.” I believe that the full range of emotions belong in life and with horses. Specifically, allowing yourself to FEEL all of the emotions is vital, preferably in a safe environment. Many worry that this condones over use of negative reinforcement with horses or “drama” in life. NOT AT ALL. If you are truly in touch with your emotions AND body, you will feel your emotions but moving into unproductive or unhealthy action on them will NOT feel good to your body. The emotions that cause horses stress are the resisted ones, because resisted emotions or not Authentic and are therefore, unsafe. Discovering who you really are, what you really feel, what you really think and questioning it before acting is a challenging journey, but well worth the time, effort and tears. These 7 steps will get you started. I encourage you to read them, ponder them, and rewrite them in your own words so that they mean more to you. Hang them up somewhere where you’ll see them. Write them on a note on your phone so that you can refer to them throughout the day. Integrate them into your life. Playfully discover the Authentic You. I look forward to reading your thoughts, challenges and successes on your journey!